Milani was a small motorcycle manufacurer based in Cesena, specializing in the production of Mopeds. Venne had been brought on in 1964 by Gino Milani, the son of the official in charge of the warehouse sales and exchanges of bicycles and engines. Garelli had a well-known engine that could be applied to almost any bicycle called the Mosquito. The first moped produced was the It, a 50 cc with automatic friction, then followed the Spluga, provided a regulator, the Falzarego, with 4 gears trasmission and the Resia, all with truly utilitarian vocation and motorized by a Minarelli engine. The leap of quality arrived in 1969 with two models determined more provided and aggressive: the Cross Contest and the Sport Contest, both were developed around a solid chassis, double cradle closed in steel tubes, supplied from the Verlicchi and equipped with the Minarelli P4-SS engine with a 20 mm Del Giardino carburetor at the side basin and discharging at "expansion". The first one a monobloc inusuale is marked by in Vetroresina that included a tank, saddles and back fender (a Aprilia production), appreciated by the young in those days who immediately renamed it the Pintail. The export version had 7.9 HP at 9000 rpm. The Sport model, with identical power and fairly similar, could reach 120 km/h. In the 1972 the Cross arrived with 6 gears, with a Minarelli P6 engine and a "tail" saddle-fender still in fiberglass, but a separate tank in sheet metal. It was voted to a road utilization and it is longed-for from the fourteen-year-old period. In 1973 at the time of the Cross Combat, provided the Minarelli P6 with thermal Allumac, a half professional one destined only to the competitions of motocross and ever approved for use on road. Always of quell' year is the "tubone" Carrera, that meet considerable success, favored from the fashion of the moment that rewarded these types of mopeds. Business is going very well and were on track to produce and to sell 7,000 units that year. Advertising Testimonial from well-known actors like Gino Bramieri, Clear Walter, Cochi & Renato where suppose to help but the lecterns of the market demand their tax: the models monomarcia suffer a lot the competition I Flatter, that with Ciao, Boxer and Capable monopolized the market almost completely. They had no luck with the unconventional Chopper, presented in 1971 and renewed in 1973. It looked very much like to the same Fantic Motor model, not especially appreciate by the Italian public though they loved them in the films but clearly not to buy and use them. To the end of the '70's, the area of the mopeds marks the nest step on behalf of the scooter, led timeless Wasp and a strong spacious offer and economically aggressive, specially to work of the dreadful Asian onslaught. A lot of small businesses, impossible to produce a diverse lineup of models, found themselves in serious difficulties and were limited to update themselves, with other that encouraging results. More solid businesses, like Gilera, Moto Guzzi, Moto Morini, Dukedoms, Benelli and the simple and younger Aprilia and Fantic Motor continued to succeed. But in just a few years, even Marchi who was also prestigious, disappeared from the market. Malanca, Meteora, Cimatti, Testi, Demm, Mondial, Torpado, Muller, Garelli, Italjet, Aspes, Bimm, Itom, where well made motorcycles and no lack of skills, but these brands were competitive in the area of the all-terrain vehicle, but they still did not sell in large volumes. This is drawn it does not save the Milani: the last model produced, the "swan song", is the attractive and innovative Cross Co. Drinks., presented in the 1975 and strong wanted from two fascinated Venetian, Umberto oil Jar and Gianni Bettella. The movement, for that a chassis was drawn completely novelty, ascends a competitive engine Sachs to short race from 12.5 HP to 12,000 turns and an exclusive and refined suspension. The means, however, is destined mainly to the private pilots that employ it in competition, is supported from a version code, motorized with the Minarelli P6 that however never happened. Always of the '75 is it "Cross Road", that ascends the old chassis of the' 69, an engine Minarelli P6 in version Compact System and traditional superstructures in sheet metal. Its line, perhaps too much inspired to the most well-known one Fantic Motor Caballero, does not succeed to lift them you of the brand and l' business, on the end of the 1979, is compelled to close the wings. The activity comes pointed out from the Unimoto of Longiano (Forli), that in the 1982 gains also the brand Aspes, but four years after is compelled, to its time, to stop the activity. 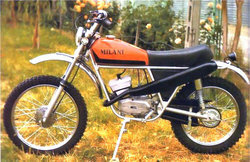 A rib of the Milani nevertheless survives still today: the brand MBM, recorded from Milani in 1970 to differentiate the production, still building bicycles.